There are a lot more than 10 out there, of course. But if you’re building a list of essential baseball books, here’s a good starting point. Veeck–As In Wreck: The Autobiography of Bill Veeck: The best sports autobiography I’ve ever read. Where to even start? Incredibly funny, brutally honest, politically incorrect, thoughtful, insightful, so much fun you’ll never want to put it down. Ball Four: The most intimate look at life in the big leagues ever written. Pretty damn funny too. I think I might go re-read this right now actually. Dollar Sign on the Muscle: The World of Baseball Scouting: Does a terrific job of documenting where the baseball superstars of tomorrow come from and how teams fight over them. Just as relevant today as when it was written more than a quarter-century ago. One drawback: Cheapest Amazon price is $37, used. Get someone to buy it for you as a gift, if necessary. The Lords of the Realm: Major League Baseball is run by some very rich, very petty men. This book, at times, makes the characters from John Helyar’s even more excellent Barbarians at the Gate: The Fall of RJR Nabisco (my favorite business book of all-time, even better than Liar’s Poker) look genteel by comparison. 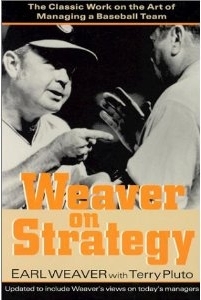 Weaver on Strategy: The Classic Work on the Art of Managing a Baseball Team: The bible of baseball managing. It’s a shame many remember Weaver as a dirt-kicking hothead and not the managerial genius and pioneer that he was. The New Bill James Historical Baseball Abstract: Brilliant writing, rich historical lore, wacky stories and fascinating analysis. Yes, please. I could have added every Bill James Abstract I read as a kid too. My dad knew what he was doing when he handed me my first Abstract when I was 9. The Glory of Their Times: The Story of Baseball Told By the Men Who Played It: My favorite part of being a baseball writer is interviewing some of the more interesting players in the game, the ones with some real insight into what happens between the lines (I could talk to Pat Neshek or Gabe Kapler or Fernando Perez for hours, if they’d let me). In this book, Ritter wisely lets a number of old-time players have their say, without the filter of heavy editing or repackaging. I’d actually recommend the audio version even more highly. Summer of ’49: One of many rich, thoughtful books by the late, great master. Like Helyar, David Halberstam’s best work may have been done on non-sporting topics. The Summer Game: Or whatever other Roger Angell book strikes your fancy. When I read someone like Angell or Halberstam, I imagine listening to West Coast baseball games on the radio, in the dark on some long lost July night, lying in bed, up way past my bedtime. The Iowa Baseball Confederacy: A Novel: Mysticism and baseball go hand in hand, and this book combines the two as well as any I’ve read, better even than the more famous (and still excellent) Shoeless Joe. W.P. Kinsella’s the first author whose works (including short stories that often have little to do with baseball) I ever devoured beginning to end. We hoped you liked reading 10 Awesome Baseball Books by Jonah Keri! A Man, A Plan, Alcantara! was this sarcasm? sorry if it went over my head.